Low temperature drying along with mixing is very essential for heat sensitive chemicals, pharmaceutical formulation etc. Rotocone Vacuum Dryer is a useful machine for effective drying. Due to vacuum the drying becomes fast at low temperature and because of rotating action the mixing is also possible, hence reduces the total process time. M/s Gudhi Engineering is a leader in Manufacturing of the Double Rotocone Vacuum Dryer. The RCVD is designed to comply the Indian FDA, US FDA rules and in accordance with cGMP specification for all Pharmaceutical Industries. We are one of the prominent manufacturers, exporters and suppliers of Special Purpose Machines and Systems for Process Industry. 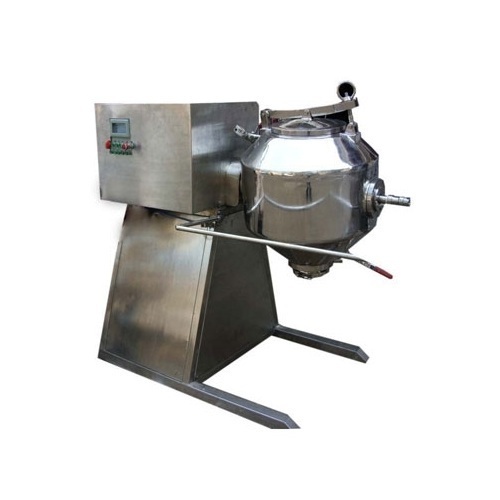 In our range, we have Jet Mill, Planetary Mixer, Multi Mill, Vibro Sifter, Rotocone Vacuum Dryer, Pharmaceutical and Bulk Drug Machines, Automobile Industry Machines, Food and Flavours Machines and Oscillating Granulator. We also offer to our clients Octagonal Blender, Pulse Jet Dust Collection System, High Speed Stirrers, Automatic Liquid Filling Machine, Steam Heated Drum Melting Oven and Automatic Stator Winding Impregnation Machine. These machines are used to cater the needs of various industries like Pharmaceuticals, Chemicals, Cosmetics, Ceramics, Colours, Dyestuff, Food products, Pesticides, Fertilizers, Spices, Detergents, Insecticides, Plastics and Resins. Owing to our expertise, we are also capable of offering concept development for new and existing projects, designing and detail engineering in various fields like Mechanical, Electronics, Electrical, Pneumatics and Hydraulics, Evaluation and Automation. The superior machines that we offer to our clients are fabricated in our well-equipped manufacturing unit. Our advanced machines have made it possible for us to offer the product range as per the specific requirements of our clients. In our sophisticated unit, these products are developed using high-grade raw material like stainless steel and alloy which is procured from reliable vendors. Further, our quality controllers rigorously test the range to ensue a flawless end product.